Huge hugeness from @Adam_KOL. 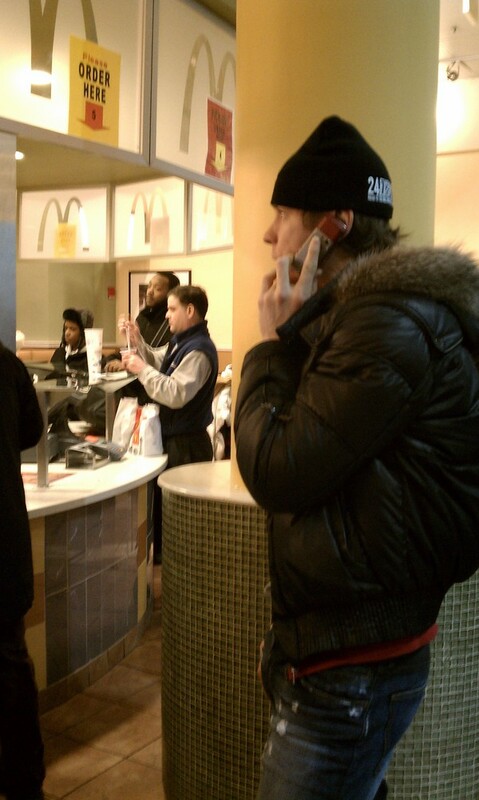 The budding papparazo scored with a killer pic of Sasha at the Union Station McDonald’s today. How far does $6.7M go with Big Macs? Can I take your order(s)? 3 Responses to Fries With That Shake? 0-0 uh oh- momma’s gonna be mad. she’s at home making pelmini, and he’s out snacking at mcdonald’s? bad sasha. i highly recommend the little thai place on the top floor (when you come up around the stairs, it’s straight ahead and on the right). roomie and i go there sometimes. she likes the tempura veggies, and i like anything with shrimp. I work a 5-minute walk from there, and he didn’t call me to join him for lunch? Bitter-cakes! He’s just making the fast-food rounds, ain’t he? BFF and I ran into him at Vapiano’s in Ballston on Friday night. I think we were the only ones who really knew who he was from the minute he stood behind me at the pasta line.